What a week, fellow beauty chicks! My high school reunion was this past weekend (see the pic above for a closeup of my hair and makeup that night, and a bit of my See by Chloe dress). It was overwhelming, exciting, intense, surreal, and -- of course -- loads of fun. But it totally wore me out! I still found a way to pick up a few new fave beauty products though. And this week they all just happen to be pint-size! Perfect for stowing in your getaway bag the next time you go on a trip. Check out what I'm totally loving this week. Hollybeth's Blossom Lip Nectar: Now, you know it's gotta be good if it takes me away from my trusty old LipSmackers. This chapstick keeps my lips so supple and soft -- even when I put it on before bed! I wake up and they're still just as conditioned. And with winter just around the corner, I'm so glad I discovered this! Plus, the lavender geranium scent is soothing, calming and reminds me of a day at the spa. It doesn't get any better than this! 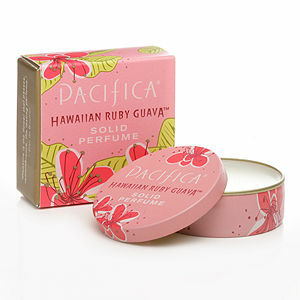 Pacifica Solid Perfumes ($9 each at beauty.com): I've long been a fan of this company's candles -- I think at one time I had at least six of the pillars and another three or four jar candles sitting around my apartment. So when I heard that they were making solid perfumes, I was totally up for checking them out. And wow, am I glad I did! Each one smells more wonderful and enticing than the next. My fave is Avalon Juniper, whose blend of grapefruit and heliotrope makes me think of walking in the woods on a crisp fall evening. And the tiny tin is so adorable -- I love sticking it in my purse and carrying it with me all day! 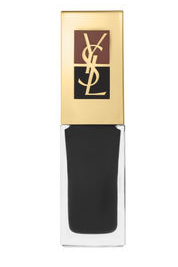 Yves Saint Laurent Long-Lasting Nail Lacquer in Tuxedo Grey ($20 at yslbeautyus.com): Totally my go-to fall shade. This deep shimmering grey is absolutely perfect for colder weather -- it's interesting, it's exciting, and it's absolutely gorgeous. Two coats will turn your nails a deep charcoal with subtle hints of sparkle -- so much better than the standard red! And isn't the bottle with its lacquered gold top so utterly chic and cool?